Status: Rare casual summer visitor south and west. Documentation: Photograph: 31 Aug-8 Oct 1983 Mormon Island Crane Meadows, Hall Co (Lingle and Lingle 1983). Taxonomy: There are two subspecies, majusculus of the southern and western United States south to Panama, and leucurus further south, to Argentina (Gill and Donsker 2017). Nebraska birds are presumed majusculus. Summer: There are nine reports, seven accepted. 31 Aug-8 Oct 1983 Hall Co (cited above). The reports from Lincoln Co in 2008 and 2009 possibly involved the same individual bird. An additional report, also likely correct, was of one seen 10 May 1999 at Crane Meadows Nature Center in Hall Co (Loren and Babs Padelford, pers. comm.). A bird possibly this species was seen in Otoe Co 29 Oct 2004, and described as “small, white hawk with black wing tips; hovered gull-like”, but the details did not eliminate the possibility it was a tern or a male Northern Harrier. Comments: Palmer (1988) noted that this species was experiencing a population resurgence, re-occupying areas where it had been extirpated and, in some areas, extending its historic range. However, during the last 10 years (2006-2015), there are only two records north of Nebraska, both in Minnesota, Aug 2011 and Aug 2012 (eBird.org, accessed January 2017), and very few records on the Great Plains, where the reports tend to be easterly. There are no records for Wyoming or Colorado, and two for South Dakota, Jul 1978 and Apr 2000 (Tallman et al 2002). Photograph (top) of a White-tailed Kite in Lincoln Co 29 Jun 2009 by Paul Dunbar. Green, R.C. 1982. 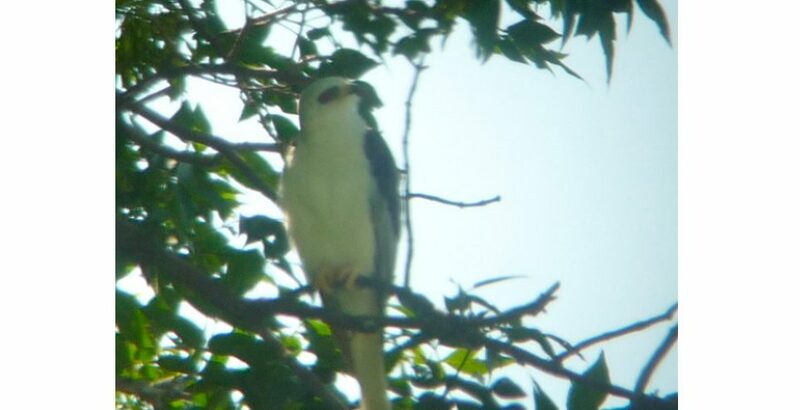 White-tailed Kite in Garden County. NBR 50: 10. Lingle, G.R., and K.L. Lingle. 1983. A second Black-shouldered Kite in Nebraska, with notes on food habits. NBR 51: 58. Morris, L. 1995. Notes on bird sightings in Nebraska. NBR 63: 60.